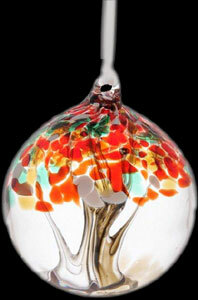 The Friendship Tree of Life mouth blown glass balls are truly amazing! Each one contains strands of glass to represent a tree and like the trees in the forest, no two Tree of Life balls are identical. A handmade and unique perfect gift for a special friend. Breathtaking glass ball with a 'tree' of glass strands inside representing Autumn, when the leaves turn to shades of gold and red. Supplied with a white satin ribbon 60 x 0.5 cm (2' x ¼") and Tree of Life label.